You are here: Home / Jewelry / Brooches / Two antique Russian brooches. These two antique Russian brooches are beautiful in a quiet refined way – they don’t scream for your attention, but it’s hard to ignore their flickering presence all the same. Brooch #1 is bold and beautiful, with a strong silver/blue color contrast. That central oval sapphire is about 11.25 carats, so it really makes a grand statement. The openwork, foliate inner embellishments and the outer arcs of the brooch are both set with old-mine & rose-cut diamonds. 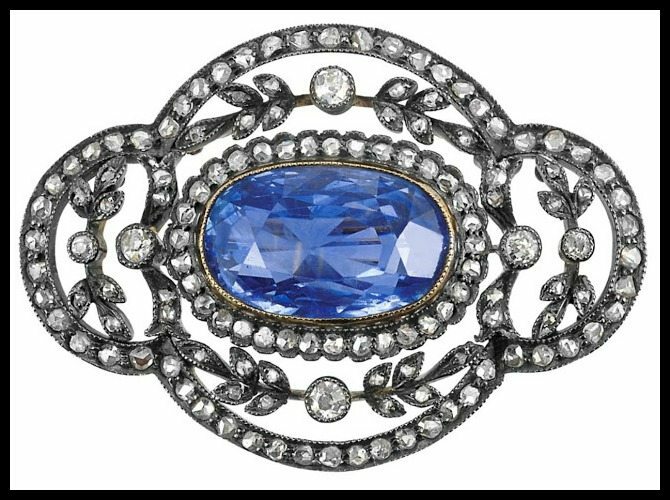 The brooch is made in silver and gold; with a lovely contrasting border of gold right around the sapphire to warm up the central element and help its color pop. I’d love to see this pinned on colorful fabric like a rich emerald velvet or a lighter pink, wouldn’t you? I think it would be wonderful on a sash or belt. Brooch #2 is equally lovely in a more delicate, understated way. This brooch is designed as a plant with tourmaline buds or leaves. The branch or stem of the plant is set with old-mine & rose-cut diamonds. This brooch is also set in silver and gold. The effect is quietly elegant and very appealing. I think it would have a marvelous forest-in-winter look on the lapel of a snowy white coat. Actually, I think this piece could be adapated beautifully as hair bling. I can imagine it winking next to an elegant updo or pinned into the side of mass of curls. Do you wear brooches? If so – what do you do with them? I’m afraid that I neglect this category of jewelry terribly. Whether you wear brooches or not: what do you think of these? These brooches were both listed in Doyle New York’s October 2012 Important Estate Jewelry sale. All images and info are thanks to Doyle New York.